For much of my adolescence, I fought valiantly against any influences that hailed from below the Mason-Dixon line. In my earliest years in North Carolina, I argued with countless other children that “y’all” was merely a contraction and not, in fact, a real word. I refused to participate in our high school tradition of wearing camouflage and neon orange to football games. For that matter, I refused to acknowledge football, period. I always chose Dunkin’ Donuts over Krispy Kreme during “which is better?” doughnut debates. Over the years, I made a few concessions. I went to Bojangle’s for lunch, on occasion. I began saying “ma’am” when I got my first job. I learned to slow down. (Or, rather, I tried to learn. I’m not entirely sure I am capable of the task.) Sometimes, I ate Krispy Kreme donuts. And liked it. As I’m sure you can guess, I learned to love the South through food. Maybe it was the cold, crunchy fried chicken my middle school friend always shared with me at lunch. Maybe it was the smoky dry ribs I devoured in that iconic basement barbecue restaurant, Rendezvous, in Memphis. Or the pimento cheese on soft, pale bread. Or the grits, shiny with bacon grease and sprinkled with grilled shrimp. Or the cornbread, which speaks for itself. All I know is, one day I was criticizing the number of Confederate flags stuck to pick-up trucks and flying from flagpoles, and the next I was correcting the misinformed people I met in D.C. who still subscribed to antiquated Southern stereotypes. And then, one night, I said “y’all.” And meant it. I’m not suggesting that I have become a Southerner. I’m not sure it’s an identity you can adopt, particularly when I’m still harboring a decidedly non-Southern accent. Rather, I like to think I’m a hybrid. I can appreciate the best of both worlds, and recognize the worst, too. I cannot recall the first time I indulged in what was likely more than one serving of this layered delight, but my most fond memory of banana pudding is on a summer evening in Beaufort, eating banana pudding by the bowlful, often adding a spoonful of hot fudge or two. (We had no concept of restraint that summer.) A close second in the memory department is eating banana pudding in Munich last year, when the Icelandic volcano left me “stranded” in Germany. My hostess loved it so much, I thought I’d take another stab at the creamy, Southern classic, served up for a European audience. And this time, I made the pudding completely from scratch. And I will also acknowledge Paula Deen for her contribution, as much as it pains me. Her original banana pudding recipe is here. 1) Heat a double boiler (or create your own with a heatproof bowl over a saucepan of water) on the stove. Meanwhile, mix together sugar and cornstarch in a bowl. Add sugar and cornstarch to the pot and slowly stir in milk. Let thicken slightly. 2) Take a few spoonfuls of the pudding and stir into the bowl containing the beaten egg yolks to heat (temper) the eggs so they won’t overcook in the pot. Then add the egg mixture to the pot and stir for another 2 minutes. Pudding should coat the back of the stirring spoon. Remove pudding from heat and let cool. 3) In a baking dish (9×9 works best, but I used a more rectangular baking dish and it was fine), alternate pudding, bananas and wafers, beginning and ending with pudding. Be generous with the banana slices–slices should be touching. 4) Top the pudding with whipped cream. Refrigerate until ready to serve. Do you identify yourself regionally? If so, from what region? Do you think it’s possible to “become” Southern? This entry was posted in dessert and tagged banana, pudding. Bookmark the permalink. Having lived in the South for 27 years (yikes) and taking on some of the traditions, especially the food, like banana puddin’ and good ol’ barbequed pulled-pork, I can relate to you. Also, I like shrimp and grits, but you can keep the too-sweet, sweet tea. We went out to Maple View Farm in Hillsborough on Saturday…that was fun. Saw a lot of bikers there and thought of you while eating my Carolina Crunch ice cream. 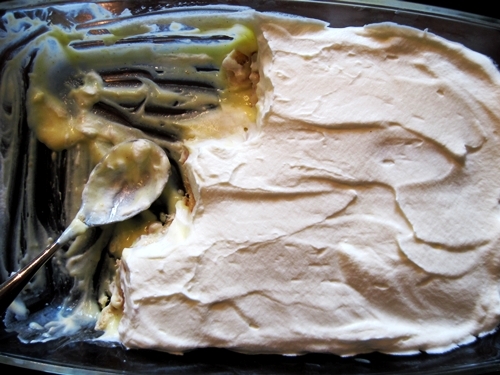 I’ll try this banana pudding recipe…I’ve never made it from scratch. I did make a zucchini bread from scratch yesterday….so good. I’m a Yankee too from Massachusetts via Washington DC. I’ve only lived here two years but am already obsessed with pimento cheese. I can’t ever get enough BBQ. Like Jeanne, I haven’t developed a taste for sweet tea and hope I never do — have to draw the line somewhere. I had Krispy Kreme Cheerwine donuts last week and now have to look away when I pass them in the market. I made this shrimp and grits (a Crook’s Corner recipe – http://grabbingthegusto.wordpress.com/2010/12/15/shrimp-and-grits-recipe/) and it was one of the most delicious dishes I ever ate. What do they put in the water here? 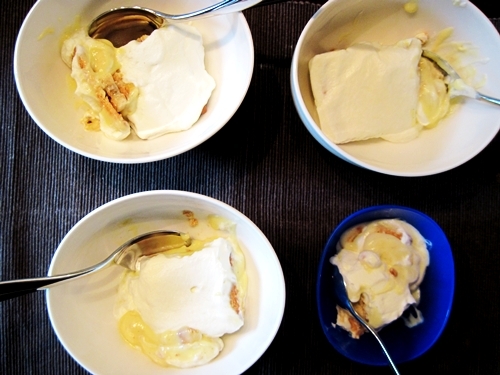 I just copied your banana pudding recipe for a cooler day when some ripe bananas are beckoning. You’ve become an enabler! Thanks for the recipe… shrimp and grits is one of my favorite meals. Especially from Crook’s Corner. And I agree with you and Jeanne about sweet tea. YUCK.